Exporting an animation from SketchUp to Thea Studio requires the user to go to the Animation Tab of the Thea Rendering Window. The most important parameter here is the Plugin selection. By default, the only option you will see is the Generic if none of the available animation plugins have been installed in SketchUp. In the image above, we have installed SketchyPhysics, Fredo’s Animator and MSPhysics. All of them are specifically supported by Thea for SketchUp and can be selected from the list. In the Generic mode, Thea for SketchUp supports all the plugins that display animation inside SketchUp when you Play scene-based animation. For plugins like Proper Animation, use the Generic mode to export animation. If you are using any of these plugins, you will find them on the drop-down list. Go to the Animation Tab. Select the appropriate plugin from the list. 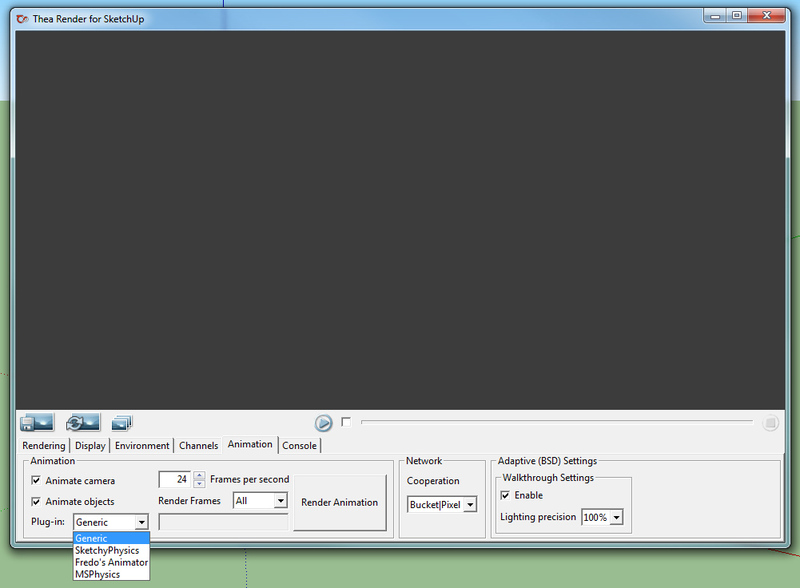 and press the Render Animation button. Immediately after is has started rendering, press Stop. Change the Save as type to either .scn.thea or .pack.thea. PreviousHow to set Thea Data & Temp folders after installation?